DEBORAH CROMBIE: But only temporarily! Today, for three and a half weeks in London with a five day excursion to the Cotswolds. And, of course, I have been through the usual packing trauma. (How many posts have I written about this???) I hate it. It's SO stressful. How to be sure you have the right things, for the weather, for whatever occasion presents itself? What if the forecast is wrong?? What if you forget something??? And I apparently have no sense of spatial awareness, because I have absolutely no clue whether or not the clothes I've agonized over choosing will actually FIT in the suitcase until I've put them in! I have hopes for the Joseph Seibel's (after two trips to Dallas to get the right size) but Yasu isn't so sure. She does, however, think my new green shirt is a perfect match for her eyes. Cats are so helpful with packing. And I have new coat, after years of wearing my lime green rain coat on every trip, no matter how cold the weather. However, it has a little liner in the upper body. Will it be too warm for mid-sixties in the daytime and fifties at night? Will it even fit in the suitcase? But that's without toiletries and electronics and work stuff. Stay tuned for comments today to see if I split the seams! Wish me luck, and bon voyage. Next post will be from London! Packing is the horrible part of traveling . . . but you do seem to have everything under control. Hope you have a wonderful time. safe travels . . . .
Bon voyage!! With that itinerary you'll have a fabulous time. We leave on the 15th for two weeks; a cruise to Bermuda, then back to NYC for five days, where we have tickets for Hamilton!! What's helped me the most with packing for trips is a changed attitude. Huge difference!! I no longer fret about looking perfect every day, having the exact right outfit, shoes, purse, jewelry, etc. 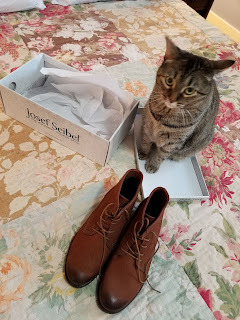 When my best friend and I went to NYC for four days the year we turned 50, I brought two pair of shoes and she brought five. I had sneakers for sightseeing and a pair of plain black dress shoes for dining out and the theatre. I've steadily pared down my packing list over the years and am pretty happy with it. When I was younger and poorer I washed my unders and hung them to dry in my hotel room. Some times I even did my tops (mostly simple cotton) and used the hair dryer on them. These days my situation is vastly different, and I'm able to take advantage of laundry services offered by hotels and cruise ships. Doing that can cut my clothing list in half! Your packing assistant is precious, by the way. I'm sure she seasoned your suitcase and clothes with cat hair so you don't forget her. Our girl Maren does the same thing. Aren't we fortunate? Have a great trip! Shoes are always a problem for me, too. I hope those cute new boots break in well and see miles of English pavement. Bon voyage! Wish I could go too! Sounds like a fabulous trip - have a wonderful time! Deb ~~ I looked at your header and thought "how does she know?' Today, if all goes well, we will NOT be leaving Nome Street. We decided to ride out Irma in our home. My packing, will be my emergency duffle bag. I hope we won't need it/them. Please forgive me for being so narrow focused. For most of yesterday the eye was placed withing 5 miles of my house. Eight hours ago it moved 30 miles to the west. Roberta mentioned recently she was going off the grid. I wonder. Is she up North? Did Lorenzo, the Cat Man, and other real people from her Key West series survive? Irma is on top of them as I write. Pah! Enough about me and my concerns. If I have power tomorrow I will update here. This blog space is very special to me. I so appreciate all of you. Deb... blue skies and strong tail winds as you head east today. I am so happy you are returning to the UK. Have more adventures that will be translated into Duncan and Gemma's lives. 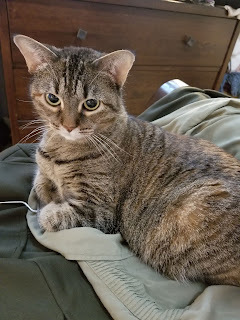 Your feline assistant might be thinking like me. She wishes to join you on the trip. Blue skies and strong tail winds as you fly east today. Have a joyful time discovering new places and plans for Duncan and Gemma's lives. p.s The coat is beautiful. Wear it with pride. Good luck riding out Irma, Coralee. We'll be thinking of you. Good luck, Coralee. With are thinking of you and of all our friends in Florida. Thinking about you Coralee. Texas resources will no doubt head your way to help out. Like Lynda, in my younger years I used to pack way too much stuff--more than half would never see the light of day on any given trip. Clean undies? Good walking shoes? Basic black pants, a nice top to go with and a scarf or necklace to dress it up--voila! one 'fancy' outfit. The rest? No one else cares what you're wearing. And, leave a little space for shopping--who knows when you might spy something irresistible? Safe travels, relax and enjoy the adventure! I've been to Paris this week, then the Isle of Man (all courtesy of JRW), and now I've got a trip to London and the Cotswolds to look forward to! Can't wait to see your postings!! Had to laugh ... 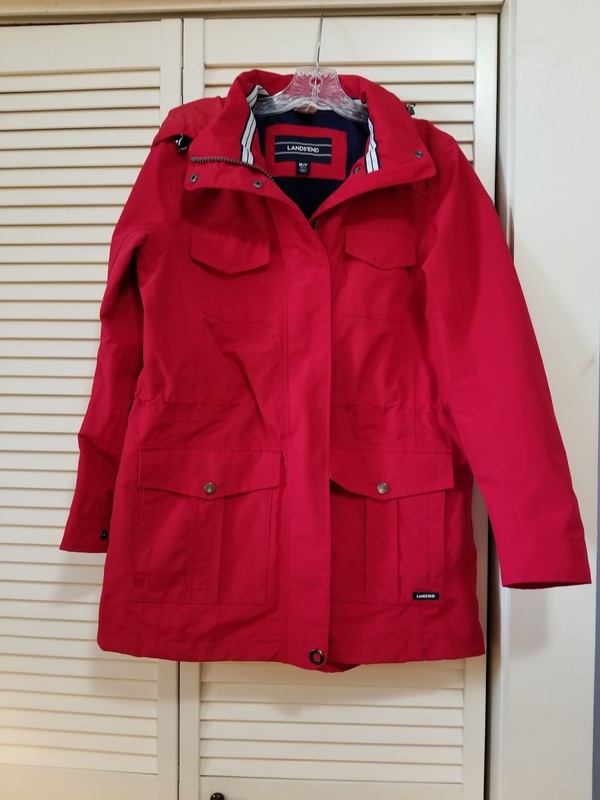 I pack more shoes than anything and my favorite travel coat is red... I'm in San Francisco now where you have to have clothes for rain shine hot cool and I've got one small carry on Bon voyage Debs! I bought a new red cashmere coat at the end of the season sales last spring. I totally love it. No one ever regretted having or wearing a red coat. Welcome to my hometown, Hallie! Hope you're having a marvelous visit. You described perfectly the range of clothing necessary for a San Francisco summer. :)) We always had the best weather just as school started in September, but with this crazy climate change upheaval, one day last week the temperature reached 106 degrees. 106!!! I'm fortunate to live about an hour south of the City these days, in the Santa Cruz Mountains, where we often get the lovely coastal weather. Wishing both you and Debs traveling mercies. I'll get someone to take a snap of me in it--assuming it's cold enough to wear it! It will be down in the fifties at night, and London can be brisk if you're walking or waiting at bus stops. I've watched Deb pack for these trips before, and I think Joan is right - beneath all the panic, Deb is very organized. She has definite ideas of what she'll need to wear and how she wants to look, and orders missing pieces, like the coat, weeks in advance. And somehow it all really does fit into that bag. 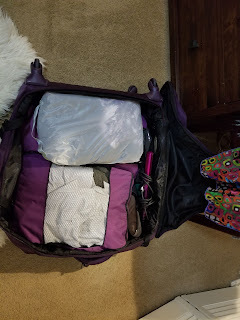 When I have to pack for a trip, I tend to count out the underwear and socks, throw in the requisite number of tops, plus an extra pair of jeans, and remind myself that I'm not traveling to a third world nation. If there's something I've forgotten, I can always buy it when I get there. Deb is much more fashion conscious than I am, but then, I suppose that's why she always looks so dashing and adorable in her photos. Safe travels, Deb. I can't wait to hear about your Cotswold adventures! True, I confess. I do plan ahead, and I don't just stuff random things in my bag. But I have to try everything on at the at the last minute to make sure this goes with that, and to weed things out. I did a little shopping ahead of time, and I shopped in my closet! I found this dark olive green knit blazer that I must have bought at the end of the season last year, and had never worn. Yay! It's fabulous! Add a black sweater, jeans, leggings, a nice pair of black pants for the posh restaurants I want to try, a few shirts and a couple of scarves. Voila! And then the shoes... Last trip I was trying to break in my now beat up Mephisto boots (the dark gray pair--the pair that was light gray before I sprayed cleaner on them...) and my feet hurt so much I had to buy a pair of shoes in London. Bon voyage my dear. I'm so glad to see you are going back to the Cotswolds again this year, obviously a love affair with a new place. Have a safe trip and I'll see you next month in Toronto. Safe travels, sweetie! LOVING that new red coat!!! I'll let you all know this afternoon whether all the odds and ends fit into that bag! I really want to take my Canon Selphy printer, so that I can put photos in my journal. It only weight 1.9 lbs, so fingers crossed! Have a wonderful trip! 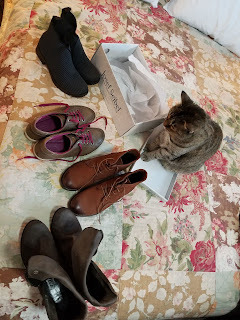 I'm amazed at everything you managed to fit in the suitcase, and I loved the kitty supervising the packing. My dog starts being a nervous, clingy wreck when he sees the suitcases come out. Love the red coat. Bon voyage! I want that red coat! Each year I pack more and more lightly. My vacations don't usually last more than ten days. I do a wash about every four days. I tell myself that since I don't care how the people I come across are dressed, they probably don't care about me, either! Have a great trip! I'm sure we'll be learning whatever YOU learn on this trip in a future book! Coralee, I wish you the best. I have relatives and friends with loved ones in Irma's path. We'll be thinking about all of you. When my middle daughter, the summer after her senior year in high school, spent 30 days in a NOLS (National Outdoor Leadership School) backpacking trip, they were told to bring only specific things, and nothing more. Each person had to carry all their belongings, plus their own food and bedrolls, in a backpack. Robin is a wiry bit of 100 pounds and change, so that 50-pound backpack was a massive challenge. They suggested ONE extra set of socks, and ONE extra pair of undies. Can you imagine, for a month? On my first trip to Europe, a two-week tour with seven other women, the weigh-nothing scarves changed up the two pair of pants, one skirt, and five tops enough that it looked like I was wearing something different every day. And the bonus was extra room in my suitcase for lovely purchases from Paris and Tuscany! Coralee, good luck weathering the storm. It's a heckuva nailbiter. Oh, wow, I can't wait to read the book that will come out of this trip. On my spring trip to England, I wore skinny jeans and long exercise tops that will not wrinkle. With my all - weather coat, I was very comfortable. Scarves dressed up the outfit for restaurants and my knee high boots from Keen added a touch of fashion and warmth. Their thick soles were very sturdy and comfortable on the cobbled streets. Exercise wear is perfect for trips where I will be outside touring ruins and castles. I'm so glad I packed the boots, too. Safe travels, Deb. Remember, you can always buy something there if you find yourself invited to a black tie gala or the like! Can't wait to hear about your adventures! Have fun! Eat good stuff. Drink good beer. Go shopping. Enjoy. Why are packing cubes great? I love your trips to London, Debs, because we all get two things, a chance to live vicariously through you while you're there and amazing new adventures for Duncan and Gemma. And, I also love that red coat, just perfect. Like Hank, I'd like to know more about the packing cubes. Looks like you're all set, with Yasu's help, of course. Have a wonderful time! One of the reasons I don't travel anymore is the packing. I did enjoy London and the Cotswolds years ago. And many prayers for Florida. I have relatives there, too. You got most of it in! I have a rolling Lipault bag and recently bought a Lipault backpack (it also rolls); great brand and the soft sides are so forgiving. Hope you have a great adventure.